What do you get when a misguided re-skinning of Titanic is crossed with bits of Gladiator and any number of disaster movies, subtracting any of the thoughtful craft that makes those films work? You get Pompeii. In 3D! From the feigned seriousness of opening with quotes from Pliny the Younger’s account of the disastrous Vesuvius eruption to the unearned emotionalism of the wretched final shot, Pompeii is a cinematic calamity. Hawker of glossy schlock Paul W.S. Anderson (responsible for several of the vapid Resident Evil films) tosses in the swords, the sandals, the downtrodden good guy, the rich girl love interest, the bad guys, and the flying fireballs, but it’s a bland mixture that is broad with its dull exposition and uninspired in its action. Two decades or so before the eruption a young boy witnesses the slaughter of “his people” at the hands of ruthless Roman Corvus (Kiefer Sutherland). 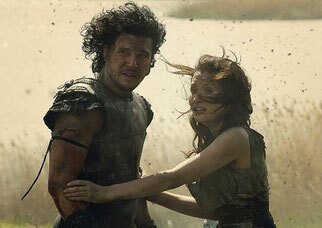 The lone survivor is sold into slavery and grows into a hunky young man known as The Celt (Kit Harington). The chiseled warrior – who is also a horse whisperer of sorts – is shepherded to Pompeii for the gladiatorial games set to take place at an upcoming festival. Along the way, they encounter young maiden Cassia (Emily Browning), en route to her picturesque cliffside villa at the base of Vesuvius. It’s probably the first mawkish meet-cute that includes the breaking of a horse’s neck. 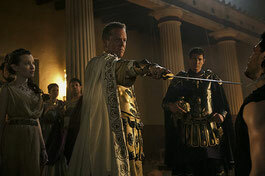 Corvus, now a senator, is also heading to Pompeii for the celebration, and to discuss a city expansion/rebuilding plan with Cassia’s father Severus (Jared Harris). Talk about poor timing for aggressive development. The scheming Corvus will support Pompeii, among other things, as long as he is promised Cassia’s hand in marriage. With the senator watching from his royal box, The Celt and his hulking foe turned ally Atticus (Adewale Akinnuoye-Agbaje) are forced to fight for survival in the arena. As Corvus looks to revel in the downfall of his rival and The Celt attempts to hack his way through opponents and into Cassia’s heart, that pesky volcano throws a wrench in everyone’s plans, blocking the sun with black smoke and dousing Pompeii with magma. Now it’s a race to escape as all the players search for a way out of the doomed city. If you love toothless political intrigue and heatless love stories, you’ll love the first half of Pompeii; if you’re more of a run-from-fireball or stale revenge fan, you’ll love the second half. If you love good movies, you’ll likely loathe everything. There is nothing here that hasn’t been done dozens or hundreds of time before. The unoriginality in the tidal waves, crumbling homes, exploding ships and panicked masses are rendered even more inert by a complete lack of care for character creation. The love of Cassia and The Celt (real name revealed as Milo) is based solely on a few blank stares and his calming of her terrified horse. There is no chance of us becoming invested in their relationship when they barely share screen time, let alone speak to each other. Sutherland is fully prepared to chew scenery, but his despicableness is but a tedious aside set against a mélange of stale personalities spouting rote dialogue. As Cassia’s mother, it appears Carrie-Anne Moss’ sole job is to look concerned in reaction shots. We know it’s only a matter of time before the volcano will unleash its fury, and there’s absolutely nothing to get excited about before it does. After the top is blown, it’s just simple subtraction as characters are dispatched as needed to wrap up their thin storylines, but mostly to react in horror from within CGI set pieces. Failing to balance sad history with embellished plot and spectacle (something that James Cameron did fabulously with Titanic), Pompeii is mind-numbingly garish, all dressed up in its ancient attire with nowhere to go. The 3D ash in the final act is well-rendered, but within the context of a vibrant city and its citizens being wiped from existence, it, and everything else in this vision of Pompeii, is woefully flat.